of course, your standard pumpkin carriage is there (a lady only needs one great ride), & the broom to signify her past, even though she seems to be running away from the thing she thinks she wants the most. see below for the painting process! fun fact! the water cup i use for painting is a thermos from a cinderella set i bought while working at the disney store of fifth avenue. once i’ve done all my research, i trace my final sketches onto tracing paper so i can fill in the background nice and tight like a pattern. 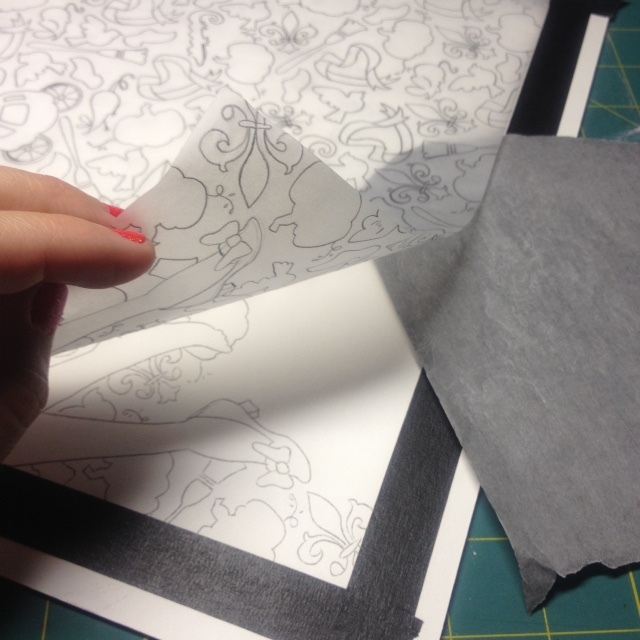 i place that tracing paper over my illustration board and use transfer paper to retrace the background pattern onto the board. once my drawings are on the illustration board, i first fill in the background with all the same colour of paint. once the background has been painted in, it’s time to start painting all the story icons! so one icon at a time, i’ll mix my paint colour and paint in all of the same icons at the same time. so all the wooden shoes get painted with the same golden ochre. all the lizards get painted with the same mint green. all the mice get painted with… well, you get it. i put some gold acrylic paint over it so it would sparkle. bon voyage & happy dancing!